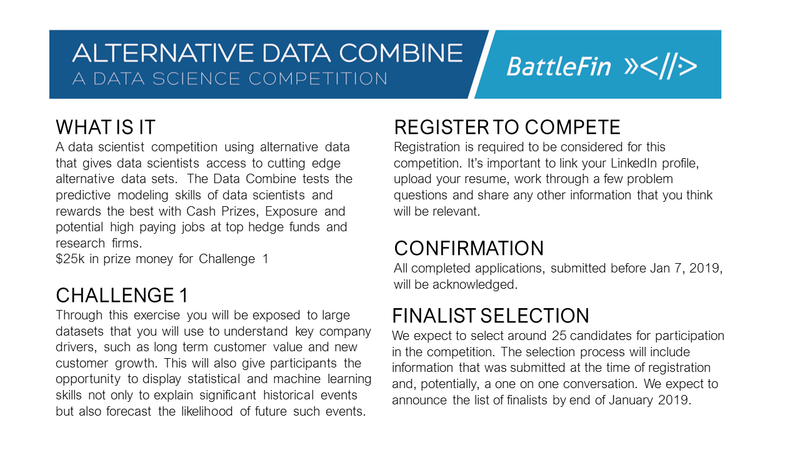 M Science, the pioneer in data-driven research and analytics, and quantPORT, a division of Jefferies Investment Advisers, LLC., are co-sponsoring the next BattleFin Alternative Data Combine, a coding competition for data scientists to create predictive models to forecast companies’ key performance indicators utilizing alternative data sets. There is $25,000 in prize money up for grabs. The Combine will consist of several stages, narrowing down entrants to a field of 25 for the competition’s main event. Once the data scientists have been selected, they will be given a historical alternative data set and a predetermined amount of time to propose methodologies and build working models to answer several questions. Data Scientists will use Ensemble sandbox environments which securely hold the data while giving them access to tools like R Studio, Rapidminer and Jupyter Notebooks. Registration is currently closed and we are evaluating responses for the competition.